Almost everything depreciates with age—except fine wine and trees. Mueller is ready with a long list of benefits of trees. Simply having a view of trees from one’s window can help in healing, he says. Trees offer shade and cooling on a hot summer day. Trees add to property values. Trees help to prevent erosion. Trees absorb odors and pollutant gases, helping to clean the air by absorbing carbon dioxide and releasing it back into the air as oxygen. Trees save water, slowing down evaporation. Trees provide shelter for wildlife. And that’s just the beginning of all that trees do for their surrounding environment. 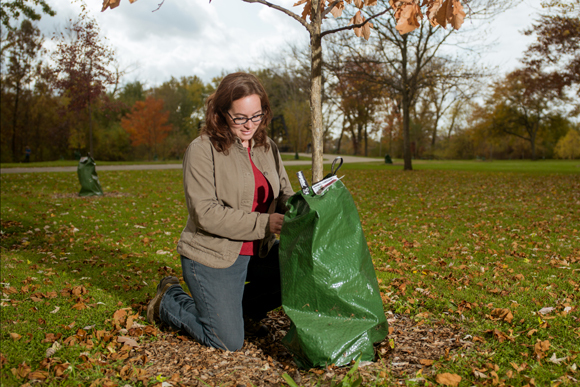 With core funding from the Grand Rapids Community Foundation in spring 2014, Urban Forest Project gathered a small staff and a group of 20 volunteers as part of a new Citizen Forester program to get planting. 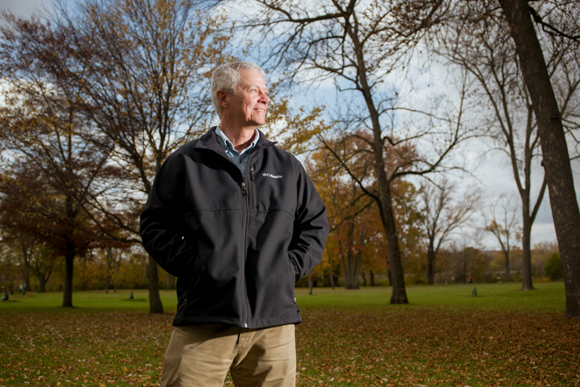 Vic Foerster“For me, it’s personal,” says Vic Foerster, consultant arborist working with Urban Forest Project. He teaches some of the classes for volunteers, called Citizen Foresters, then guides them in the proper planting of trees. That, Foerster says, is just another benefit of maintaining a clean and beautiful city filled with a diversity of trees. With that still painfully in mind, Foerster teaches the Citizen Foresters that diversity of trees is important, so that if one type of tree becomes afflicted with diseases or pests, others survive. Urban Forest Project began a crowd-sourced tree-mapping project in 2012. Anyone can map their tree(s) on an online map and all are invited to do so. The Citizen Forestry program is a large part of that. Education and training for citizen volunteers is provided through Friends of Grand Rapids Parks. Citizen Foresters are taught about tree identification, planting and maintenance. They become advocates for trees in their own communities, passing on what they have learned and getting others involved in neighborhood-based tree projects. 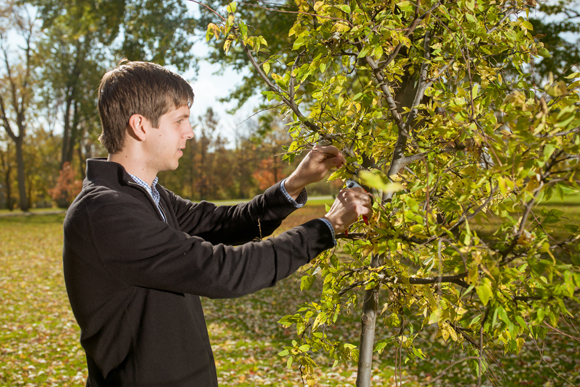 To become a Citizen Forester, one must attend four classes (tree planting; tree maintenance and pruning; tree identification; the value of trees) and participate in at least two volunteer opportunities. Urban Forest Project wants to be needed less and less, Mueller says. The hope is that neighbors will inspire neighbors, and communities will plant and maintain more trees on private as well as public land. “We also offer seed money in the form of mini-grants to anyone who wants to start an urban forest project of their own,” says Mueller. That includes, he says, starting an urban orchard, part of the Community Orchard Program to increase attention given to food security, food deserts, and edible landscapes. Urban Food Project also lends out tools and supplies for these projects. “The large rock we still have to move is to get more of the public involved,” adds Foerster. Contact Urban Forest Project to learn more and to get involved. Zinta Aistars is creative director for Z Word, LLC, and correspondent for WMUK 102.1 FM Arts and More program. She lives on a farm in Hopkins. Grand Rapids has set a goal of planting enough trees so that 40 percent of the city is covered by tree canopy. Friends of Grand Rapids Parks is organizing several tree plantings this fall, and the nonprofit plans to plant 109 trees this month. Click here for a list of scheduled tree plantings.